“Standing here, receiving this award has given me the assurance that I have made the right choices in life and I am on the right track. The most important people in my life who have shown me my purpose in life, who have been my best teachers, my gurus, who have inspired me, molded me, defined and refined me. They are none other my dignified students. It is because of them that I stand on this stage to receive this prestigious award. My sincere and heartfelt salutations to all the students who have come into my life and walked this journey with me. This award belongs to them and May God continue to walk with them” said Santhi Suppiah in her acceptance speech. Santhi from the Australian Matriculation (AUSMAT) programme, Sunway College received the Award for Excellence in Teaching at the recent Teaching Appreciation Day. A Senior Lecturer who has been with Sunway College for 17 years, she teaches mainly in AUSMAT and on a special teaching assignments in other programmes such as the Foundation in Arts (FIA), Monash University Foundation Year (MUFY) of Sunway College and the Psychology Department of Sunway University. “I always had the freedom to be whom I choose to be in Sunway. There are definitely ample opportunities to grow and I view Sunway as a provider of a platform for life-long learning not only for the students but for everyone here who wants to learn. This has kept me going without realising that I have been here for so many years but they are for sure memorable years. Most importantly, it was in this place that I discovered my purpose in life, which was the biggest turning point in life for me” said Santhi in reply when asked what she liked most about being in Sunway. 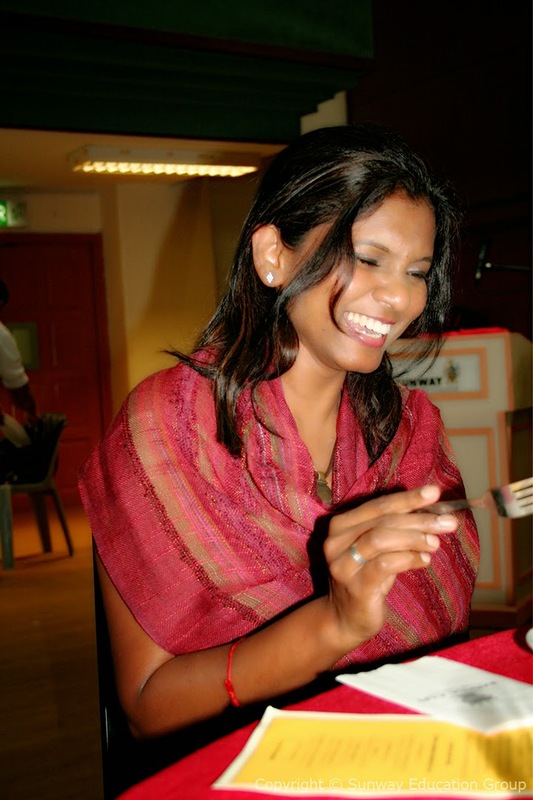 In her mission to make a difference, Santhi takes on additional responsibilities which include initiating the AUSMAT Academic Student Mentor system, she has successfully explored the international market for AUSMAT in Maldives and followed through as the AUSMAT International student mentor. She is also the AUSMAT programme counsellor. She was the Head of the Secretariat for the 1st and 2nd Pre-U Conference and this year, she was the Head of the Secretariat for both the Asia Leadership Trek in January and the Asia Leadership Conference and Camp in August. As Head of the Secretariat, she was provided the opportunity to guide student leaders and student volunteers from the various faculties of Sunway Education Group. “There are many memorable moments but there is one that puts a smile in my heart. A student of mine who was pursuing his first year of studies in medicine at the Melbourne University in 2007 surprised me by calling from Melbourne on Teacher’s Day May 16th to wish me and has continued to do so for every Teacher’s Day since then. In fact when I changed my mobile number, he surprised me by sending a Teacher’s Day message to me through the program director’s mobile phone. I was just amazed and captivated by his move to reach me”, said Santhi of her most memorable moments as a teacher. On teaching, “It is the best profession in the world, and to know that you have been chosen to make a difference in others’ live is more than what you could ask for. To me, teaching is a right given to teachers to nurture the students from every aspect of life. It is not just knowledge from books alone but beyond that. I have the greatest opportunity to teach my students about life with a personal touch. It is my hope that teachers incorporate life in their teaching as much as they can because that will take their students to greater heights in life more than their scores and grades.” Santhi is an avid reader, her favourite book being “Thought Power” by Swami Sivananda, a book that teaches one to control their minds, enhance concentration and focusing one’s thoughts. Clearly Santhi is very focused on her passion for teaching and nurturing young minds. MUFY @ SUNWAY COLLEGE KL SOAR!